Well, maybe I should just cut and paste the intro from several of the other Five Reasons articles this season. We know the problems, we even have a pretty good idea about the solutions. With almost half the games of the season gone, Villa are only three points up from last season’s corresponding results. Not much sign of improvement. January window awaits, Lambert has a chance to spark Villa back into life. Etc, etc. 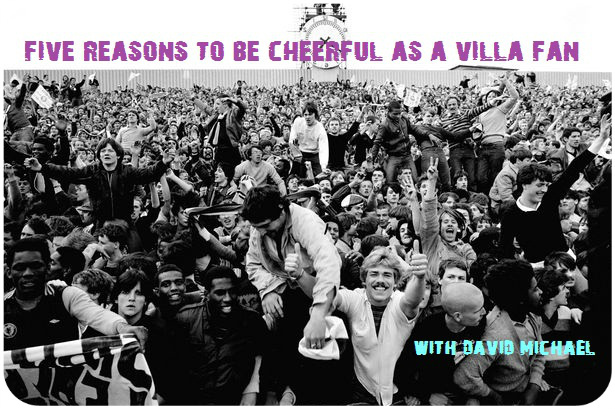 So what are the reasons to be cheerful as a Villa fan this week? 1. “If we play like that against Palace and get the breaks, we’ll be fine.” – Paul Lambert. So that’s a guaranteed three points on Boxing Day then. Excellent! 2. It’s getting so predictable now, you can actually just imagine the game, rather than waste time watching it. 3. We’re only 11 players away from being a really, really good team. 4. The January transfer window is less than two weeks away. I think that’ll provide a big clue to the club’s ambition. Seriously speaking, a couple of quality players brought in could transform the team. Hopefully the club will be bold enough to get them in. 5. At least Libor Kozák and Marc Albrighton showed some conviction against Stoke. Kozák has had his knockers, but at least he can be relied on to chip in with goals and he celebrates scoring them with feeling. While Albrighton at least gives the crowd something to cheer. The problem is will he also turn soft like several other players, if he’s offered a new contract? Positive No.6: Having Claret shorts looked nice. entirely agree, especially the second point. playing westwood seems like an idealistic strategy; one that assumes we have the passing and movement to harness his supposedly genius ‘footballing brain’. also: time to accept that Tonev is total balls (thanks Petrov), and time to ask what the blazers has happened to Weimann.